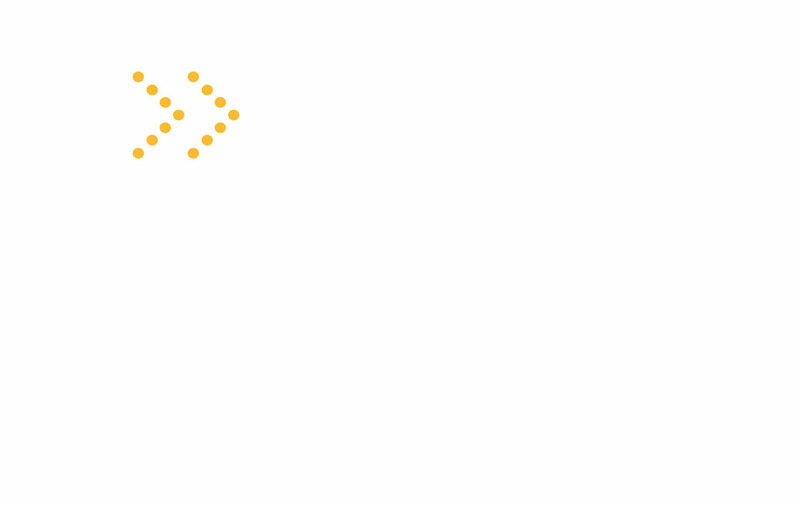 Below, we present the authentic recipe of a Valencian paella with the typical ingredients from the irrigated land of Valencia, which over the years has been passed on from father to son. Valencian paella recipe for 10 people. We recommend using a 60 cm diameter paella pan. 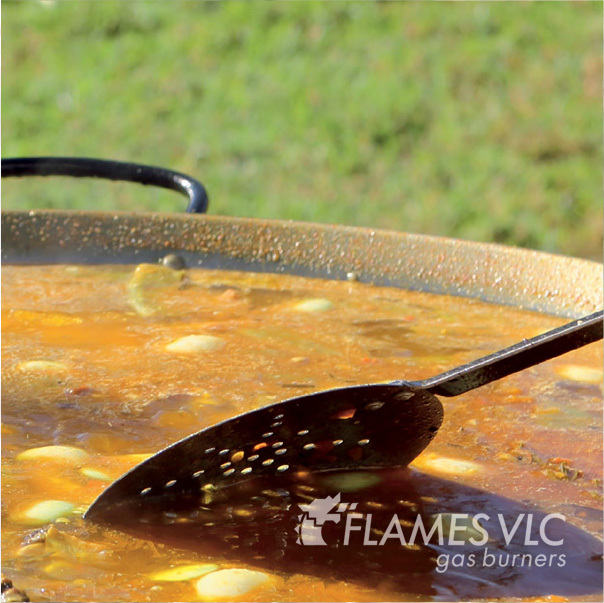 Pour the oil evenly into the center of the paella pan and light the paella gas burner .When the oil starts to smoke, add the bite-sized pieces of meat with salt and simmer to brown it carefully on the paella burner. 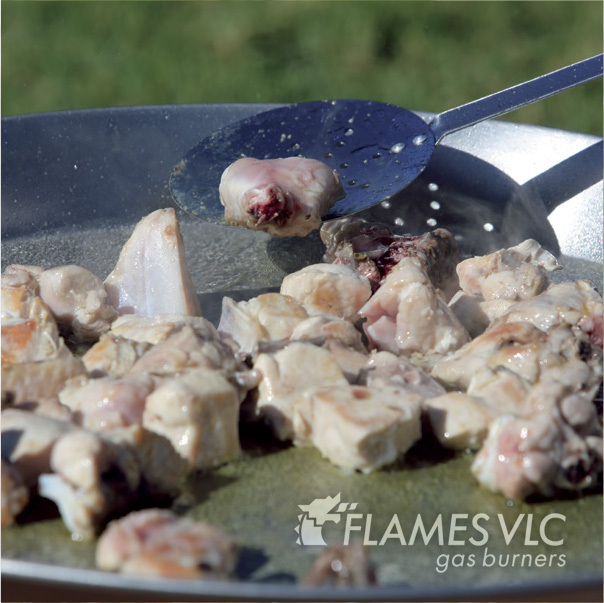 Ensure that all the meat is fully browned. Add the chopped green beans and sauté for a few minutes until golden. 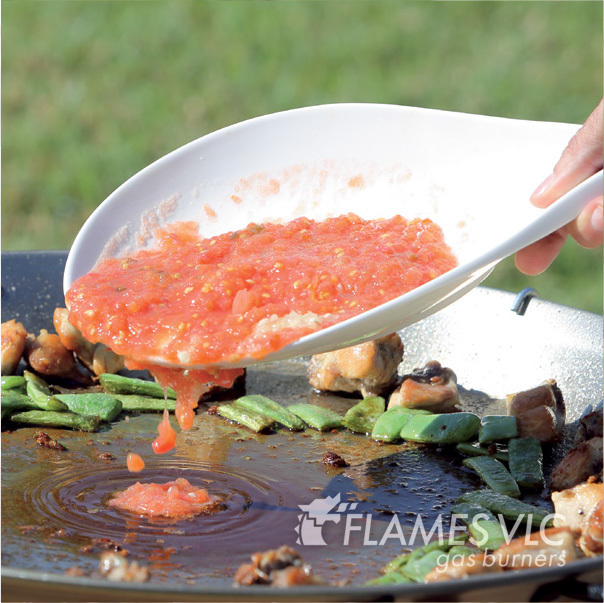 We make a space in the center of the paella pan and add the tomatoes and the crushed garlic. Fry lightly for a few minutes and add the paprika at low heat. Sauté for another minute, stirring all the content of the pan. 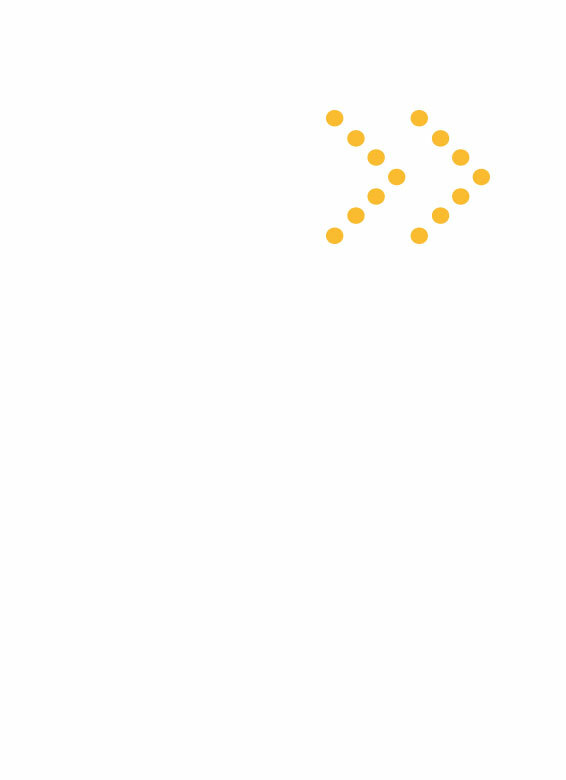 Pour in 3 liters of water and measure the level with a palette. Add more than 3 liters of water and some salt. Cook for 25 minutes at medium heat, making sure that it does not boil excessively in order to avoid adding further water. When the water reaches the level previously measured with the palette, taste for salt. The stock should be slightly salty, as part of the salt will be absorbed by the rice during cooking Add the broad beans and, one minute later, the rice. When it starts to boil again, add the artichokes cut into 8 parts. Add the saffron and mix the rice evenly in the paella pan, ensuring that it does not stick to the meat or vegetables without being submerged in the stock. 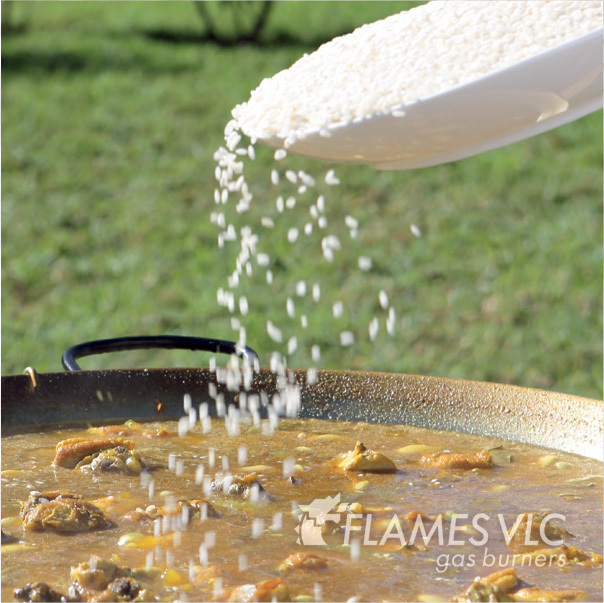 Light up the paella gas burner at a very high heat until the half-cooked rice begins to surface (about 7-8 minutes). Lower the heat almost to a minimum and add a couple of springs of fresh rosemary. Cook for a further 3 or 4 minutes at a low heat before blow out the burner. Remember: it is important to let the paella stand for a few minutes. 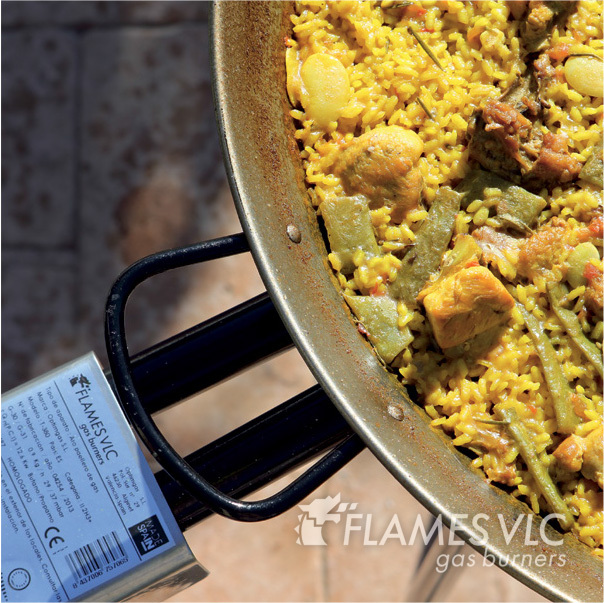 In the preparation of paellas, just when you have to cook the rice, it is very important the fact that the burner provides enough fire. 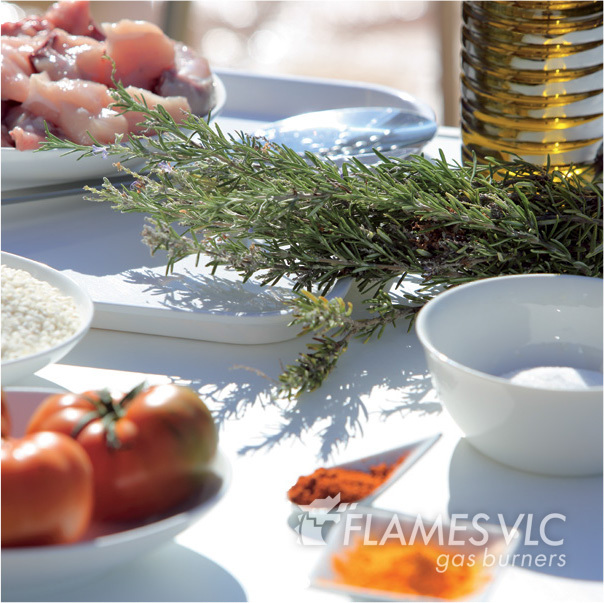 This is guaranteed with the powerful paella gas burners FLAMES VLC.